Shohei Ohtani is the best thing to happen in this MLB season so far. Not only is the dual pitching/hitting threat trying out a regular routine that’s essentially never been seen by any living baseball fan, he’s also succeeding at it. In an obviously small sample size, Ohtani is hitting .364 and throwing a 2.08 ERA while slugging better than any Angels hitters and striking guys out at a better rate than any of his team’s pitchers. It’s amazing. If there’s any moderating effect on Ohtani-mania, however, it’s the fact that its object of affection doesn’t actually play that much. Ohtani gets six days rest between pitching performances, and doesn’t hit on days before or after those starts. With those restrictions, he has only two starts and 24 plate appearances out of 13 Angels games so far. 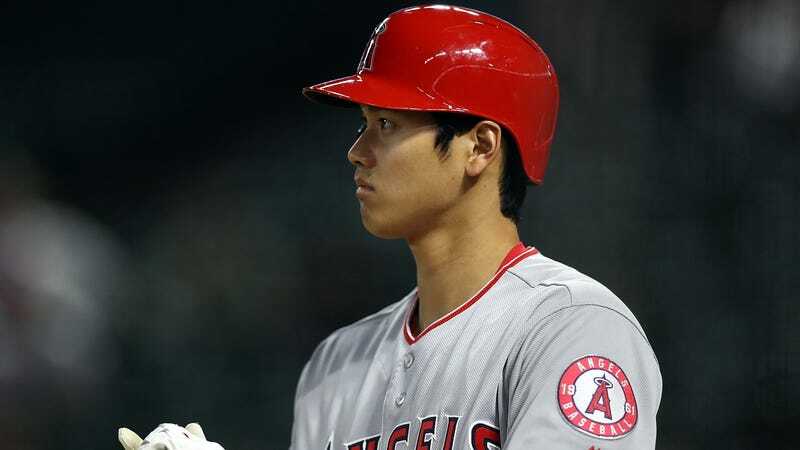 “I talk to the medical staff every day, and they see how I’m doing, my strength level, to see if I can play that day,” Ohtani told reporters via his translator after the Angels’ 7-2 win on Wednesday night. You can see why the Angels want to be cautious. Ohtani’s only 23, and if they want to keep him around for a long time, it’s a good idea to keep him as healthy as possible. There’s also a much bigger issue at play, which is that nobody has tried to do what Ohtani is doing in over a century. There is no easy playbook to follow when it comes to managing a two-way player’s workload because a two-way player has never existed in modern baseball. The only way to really find out what is and isn’t too much playing time is to experiment. But there are good reasons to avoid caution, too. What’s especially weird about this Angels roster is that it’s unclear whether they’re playing the long game or trying to win now. Despite having the best player in the world since 2012, the Mike Trout era has still only seen a team that’s failed to open any kind of window for success. Trout has never even won a playoff game. But their April play has been encouraging, and enough to put them in an early lead at the top of AL West in what will surely be a fierce battle with the Astros. Especially if Ohtani keeps it up, this Angels team can compete with the best. Trout is only signed for two more seasons after this one, however, and there’s no guarantee he’s sticking around, even on a team that’s improving. With that in mind, the Angels may only have three years of Ohtani and Trout, which could potentially be one of the greatest teammate duos of all-time if Ohtani lives up to his full potential. That makes every game valuable and in need of Ohtani’s presence. It’d just be cruel of the Angels to deny everyone a full-strength roster that has the chance to be truly special. From a purely selfish perspective, I want to see as much of Shohei Ohtani on a baseball field as possible. The one time Ohtani actually played in three straight games, he homered in all three of them, and it was easily the most exciting thing to happen in this freezing-cold start to the MLB season. Just give me all Ohtani all the time. Hell, let him be the manager, too.